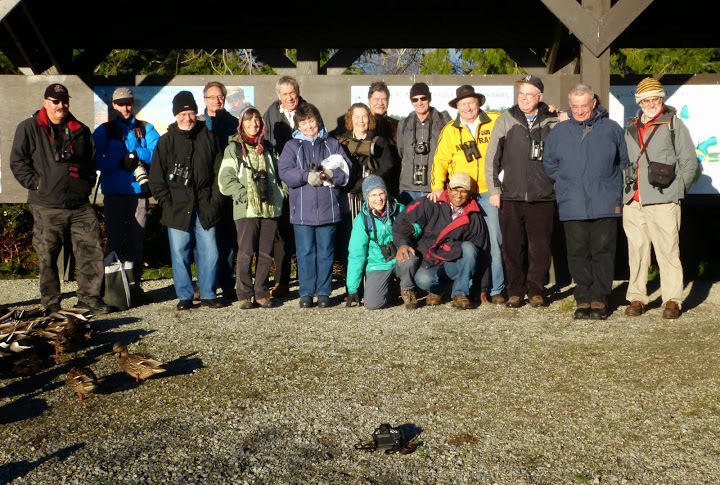 At least sixteen DNCBers enjoyed a sunny, relatively mild morning of birding on the way to and at Reifel Bird Sanctuary. In addition to the expected beauties when we go to our Birders’ Mecca Reifel, additional hi-lites were several Western Meadowlarks, Virginia Rail and Hans’ American Bittern. Check out fantastic photos on the DNCB Picasa link. Eleven of us in 3 vehicles (good car-pooling) left Petra’s at about 8:15 a.m. (someone was late again) this morning (Monday). We were: Hans with Gerhard, Bryan & Janet; Mike with Glen and PB Lorna; and Mary-Pat with Terry, newbie English guest Dave and me. Richmond Bill met us at our first stop, the taxi pull-off on the causeway to the Ferry Port. The tide was very high; we saw the expected Common Goldeneye (doing their neck-breaking mating dance), Common Loons, Bufflehead, Scaup, Double-crested Cormorants along with lots of Northern Pintail, Mallards and American Wigeon. Next was our usual stop by the No Parking sign at the jetty. We were blanked on the Rock Sandpiper, Snow Buntings and Black Turnstones, but a few Surf Scoters, Red-breasted Merganser, Horned Grebe and a Harbour Seal provided a tidbit of entertainment. We proceeded through the Tsawwassen First Nations, not stopping until 33A Avenue where a flock of Trumpeter Swans (~ 200) caught our attention in a farm field. Not far from the Swans was a small flock (~400) of Snow Geese. Interspersed among these flocks were hundreds of ducks mostly Northern Pintail and Wigeons and a few Green-winged Teal. Indeed, we saw thousands of waterfowl in many of the fields in Ladner and on Westham Island. Bald Eagles would regularly “raise” these flocks and one Baldy was even seen “eating on the fly” as it cruised by with something in its claws. We continued to the “look-out” onto the Fraser River at Canoe Pass where it looked as if a pair of the resident Mute Swans was setting up their nesting spot at the rear of one of the float homes. Nothing else unusual in the River (Goldeneye, Bufflehead, Seal) so we headed across the bridge to Reifel where Tony, South Slurry Al, Jean and the slick-talking numerate Otto were patiently waiting along with a dozen voracious Sandhill Cranes. Following intros and a chat with Laura, we wandered down the path, hungry Cranes in tow. Lots of Sparrows at the front feeders (Song, Golden-crowned, Fox and the invasive House Sparrow) near to where a couple of Black-crowned Night Herons were roosting. The pond behind the office had a couple of Greater Scaup among the regular ducks species. Lots of beaut pairs of Hooded Mergansers in the first slough. Bryan took the obligatory Group Photo at the Reifel Billboard. Simultaneously, the comedic Tony was trying to take his patented “group ground shot” while surrounded and harassed by starving ducks and cranes. See photo evidence of this charade on our Picasa site. A pair of gorgeous Wood Ducks was perched and feeding with Red-winged Blackbirds on a feeder nearby. Interestingly, we saw over 20 pair of Wood Ducks throughout the Sanctuary today. Sadly, we saw no Owls. As many of the ponds were frozen, we decided to walk the outer dike path. Several Gadwall were in the first outer pond where the Belted Kingfisher gave PB Lorna her regular thrill. In the south marsh were several Northern Flickers on a log, and then a bunch (5 or 6) of unexpected Western Meadowlarks joined them. The sun was shining as we walked the outer path and a huge flock (~5000) of Snow Geese, raised by something, glistened brilliantly as they circled in the sky then landed again on the foreshore. Lots of Northern Harriers gliding above the marsh; one was harassing a possible Rough-legged Hawk perched on a post. An occasional Marsh Wren was seen darting among the rushes. Then, in Roger-like Spoonbill sighting methodology (or is it mythology), sharp-eyed Hans spotted a reclusive American Bittern briefly flitting in the reeds. Toward the tower, while Bryan was photographing a Bewick’s Wren, a Virginia Rail wandered across the path. We tried in vain to call it in so others could see it. Beneath the tower, several Golden-crowned Kinglets gave us some nice up-close-and-personal looks. Mary-Pat climbed the tower and saw our only Shorebirds today, a flock of Dunlin swarming just off shore. On the path back toward the entrance, we visited the new Blind; the Common Mergansers (~20) were in this slough. We saw a Downy Woodpecker, then a rather uncommon Hairy Woodpecker. We searched in vain for Cackling or White-fronted Geese among the Canada Geese in the neighbouring potato field, but did see several Northern Shovelers among them. Bryan saw and photographed a Varied Thrush. We got back to the entrance around Noon, and thanks to reliable PB Lorna, I enjoyed a delicious egg salad sandwich and a tasty tart. Quick Learner Mary-Pat also shared some of her scrumptious home-made cookies. We wished each other a Merry Christmas, bon voyage to Brit guest Dave, and took off home. Another super DNCB outing. DNS: Delta Naturalists are a group of nature lovers whose aim is to foster interest in the natural history of the Fraser delta by sharing and enjoying nature and promoting environmental awareness and conservation. DNCB: Delta Nats Casual Birders is a group of Casual Birders who go Birding at different locations each week, usually within the Lower Mainland or in nearby Washington State. This entry was posted in American Bittern, Bald Eagle, Canoe Pass, Harbour Seal, Northern Harrier, Reifel, Rough-legged Hawk, TFN, Tsawwassen Ferry Port, Virginia Rail, Western Meadowlark. Bookmark the permalink. Wed April 24 Whidbey Island, USA. Leave Petra’s at 7am; leave Peace Arch Parking Lot at 7:30; drive to Keystone Ferry Terminal for 10:15 ferry to Port Townsend & 11am ferry back. Then Deception Pass State Park. Wed May 1 UBC Botanical Garden. Leave Petra’s at 7:30; meet at Garden parking lot at 8:30; register at meter for 3 hrs free parking. Wed May 8 Tennant Lake, USA; Leave Petra’s at 7:30; leave Peace Arch Parking Lot at 8; drive to Tennant Lake Fragrance Garden (5200 Nielsen Rd in Ferndale) – 20 minutes from Blaine – take I-5 to exit 262 – right on Main St/Axton Rd – left on Hovander Rd – right on Nielsen Rd.